Aspiring daredevils are being given the chance to have a go at wingwalking at the forthcoming Wickenby Wings & Wheels event. The show, being held during the weekend of 16-17 June in Langworth near Lincoln, is a mix of vintage vehicles and classic aircraft. As part of the weekend, visitors can have a go at wingwalking for themselves, with a limited number of training flights available in a 1940s Boeing Stearman Biplane. The experience includes a full safety brief and walk through the practice display. Once airborne you will take part in a 10 minute display practice in front of friends and family including fly pasts at various angles of bank and finish with a zoom climb from 135 mph. 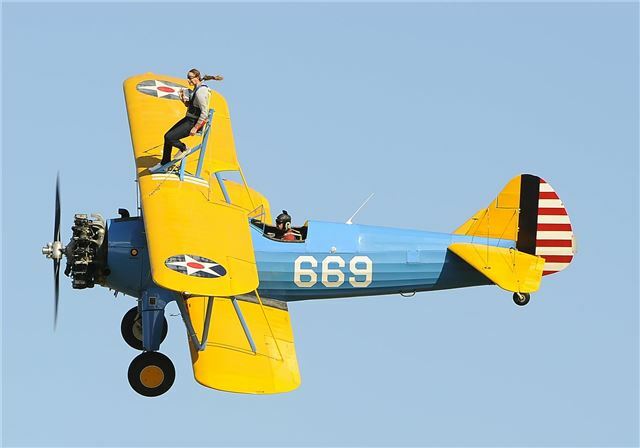 After landing you will receive a certificate confirming you are a trained wing walker. Those thinking of giving this as a Father's Day gift should submit an enquiry form via http://www.aerobatictactics.co.uk/wing_walking.html quoting reference WWW to receive further details and a quote, discounts available for one or more bookings.Wing Walkers must be under 12 stone (77kg) and sign a fitness declaration. Other displays include a flypast from the Royal Air Force aerobatic team the Red Arrows on Saturday and The Matadors featuring former Red Bull Air Race pilots on Sunday. In addition there's large collection of vintage cars and motorcycles, children's entertainment and 4x4 off-roading.